Namibia is a country in southern Africa lined in the west by the Atlantic Ocean. It shares land borders with Zambia and Angola to the north, Botswana to the east and South Africa to the south and east. Namibia gained independence from South Africa on 21 March 1990, following the Namibian War of Independence . Its capital and largest city is Windhoek. Namibia has a population of 2.1 million people and a stable multi-party parliamentary democracy. Agriculture, herding, tourism and the mining industry - including mining for gem diamonds, uranium, gold, and silver - form the basis of its economy. The large, arid Namib Desert has resulted in Namibia being overall one of the least densly populated countries in the world. Neonatology is a pediatric subspecialty that focuses on all aspects of the medical care of neonates. The American pediatrician Alexander J. Shaffer coined this term in the introduction to the first edition of his book Diseases of the Newborn in 1960. Since then, enormous progress has been made in neonatology in developed countries with large improvements in survival chances for sick term and preterm infants. In contrast, neonatal care in low and middle income countries still lags by decades. In 2000, the United Nations launched an initiative called The Millennium Development Goals (MDG) to improve health and education and end alleviate poverty. The target of MDG 4 was to decrease under-five mortality rates (i.e. number of deaths before the age of five years among 1000 live born infants) by two-thirds between 1990 and 2015. Globally, the number of deaths of children under 5 years of age fell from 12.7 million in 1990 to 6.3 million in 2013. The first 28 days of life – the “neonatal period” – represent the most vulnerable time for a child’s survival. Close to 50% of all under-five deaths occur during this period. 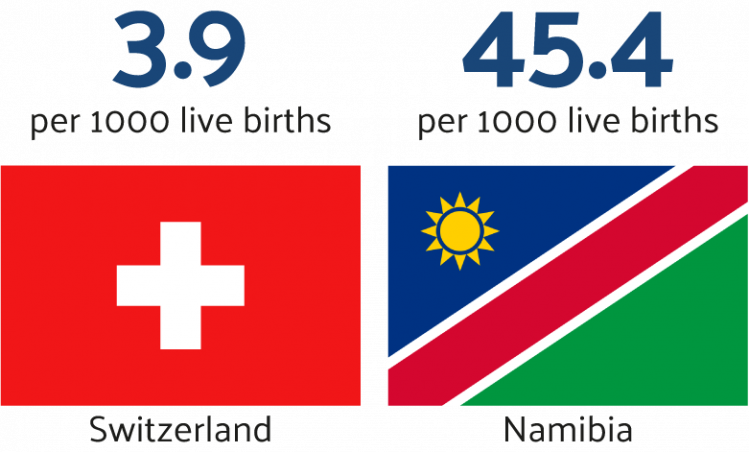 In 2015, the under-five mortality rate in Namibia was estimated to be 45/1000 live births; it is therefore more than 10-times higher than in Switzerland. In addition, it is likely to be significantly higher in the poor Kavango region in the North of the country where NEO FOR NAMIBIA is active. A large number of under-five deaths already occur in the neonatal period. Improving care for these patients is feasible and likely to have a large impact on the under-five mortality rate. How many children die before their 5th birthday?